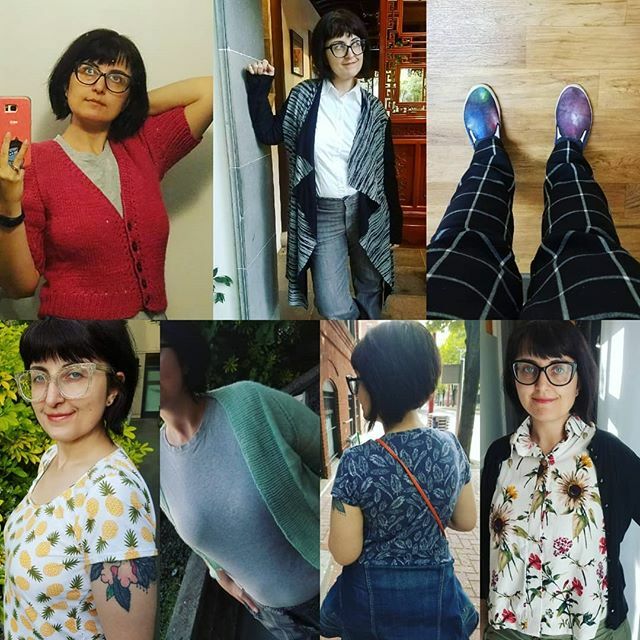 June 2018 | Oh Sarah O ! With all of my Eurovision posts, you've got to be wondering who the winner of Eurovision 2018 was!? This year's Europeon song contest was a close race, but ultimately it was Netta's super kawaii, clucking good, girl power performance of the song 'Toy' ,representing Israel, that took home the prize. Watch the performance below if you dare and prepare to have your mind blown! The March Sew My Style Challenge pattern was the Kalle Shirt + Dress by Closet Case Patterns. I was a little nervous about sewing a pattern with a button band and collar but decided to dive in feet first. I knew that I wanted to make some version of the Kalle Crop Top since I wear a lot of collared shirts to work, but I couldn't pass up that curved hem on the Kalle Shirtdress either. Both were going to be a challenge, but I was up for it! First I decided to tackle the Kalle Crop Top (version A) with the full collar and hidden button placket. I used Telio Picasso Rayon Poplin floral print fabric from Fabric.com which handled like a dream and was perfect for spring. I added 2 inches to the length of the shirt so that it covers my belly button and made a size 6 shoulder graded to a size 12 at the bottom. Since I'm a noob, I followed along with the Kalle sewalong on the Closet Case patterns website without difficulty. I should note that I still have to wear a tank top under this shirt to make it "work appropriate" due to the high side slits and I'll probably add an extra button to the top, but I flippin' love this shirt! Next, I decided to whip up the Kalle Shirtdress (version C) with the shirt collar and standard button placket. I used jade Tencel Twill fabric from Style Maker Fabrics- it's a medium to heavy weight fabric but feels super soft. I again added 2 inches to the length to get the dress to hit my knees and this time I graded the pattern from a 6 at the shoulders, 12 at the waist and 14 at the hips and I'm pretty pleased with the fit. I was really pleased with the directions and sewalong instructions with this pattern and hope to make a lot more Closet Case Patterns in my future. Today I'm sharing another Eurovision 2018 song contender. Michael Shulte represented Germany with his heartfelt song about the loss of his father called 'You Let Me Walk Alone' which ended up in 4th place this year. Check out his performance below and try not to shed too many tears. If you subscribe to Netflix and have browsed the new releases lately, you'll have noticed that the Netflix original series Unbreakable Kimmy Schmidt has debuted its 4th and final season ( 😢) and it is not to be missed! In this season we find Kimmy working at her new job at Giztoob, Titus Andromedon working on his acting career, and a True Crime parody featuring The Reverend ( Jon Hamm) that is comedy gold!